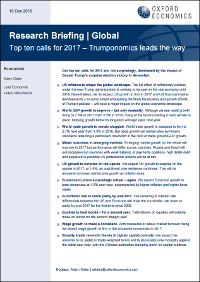 Our top ten calls for 2017 are, not surprisingly, dominated by the impact of Donald Trump’s surprise election victory in November. The full effect of reflationary policies under the new Trump administration is unlikely to be seen in the real economy until 2018 with world GDP growth and trade growth remaining moderate next year. Nevertheless, we do expect US growth to firm in 2017 and US financial market developments – to some extent anticipating the likely fiscal policy and growth effects of Trump’s policies – will have a major impact on the global economic landscape. Our top ten calls also include the euro dropping to parity with the dollar for the first time since 2002, UK and Eurozone growth surprising on the upside, stronger wage growth in advanced economies, a mixed picture in emerging markets, tighter capital controls in China keeping the renminbi stable and equities to beat bonds for the second straight year.